Photo courtesy of the UT News. The Ward M. Canaday Center for Special Collections currently has two concurrent exhibits on display. ‘Letters to Luminaries’ features notable, signed letters and other correspondence from the Center’s collections. Famous people from all walks of life: writers, scientists, activists, politicians, and noted Toledoans of all stripes are represented in the display, as well as letters from common people in extraordinary circumstances. 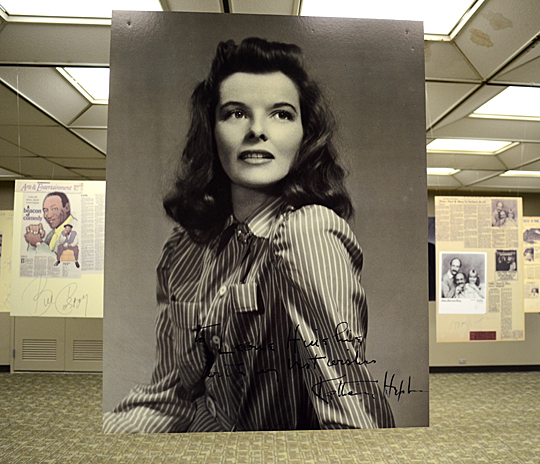 Just outside the main exhibit area on the fifth floor of Carlson Library, the gallery features enlarged signed photographs and articles featuring some of the many celebrities and entertainers that have appeared on campus throughout the years. Both exhibits will run through July 31st, 2014. The UTNews did a great article with more information about the exhibits that we encourage you to read. For more information, contact Barbara Floyd, Director of the Canaday Center, at barbara.floyd@utoledo.edu or 419-530-4480. Please stop by the Carlson Library concourse this week to see a video & photo display celebrating the Ottawa River that runs through campus. Many other events are planned for the 2013 Celebrate Our River Week, see the UT Journal post from S.E.E.D. for more details. 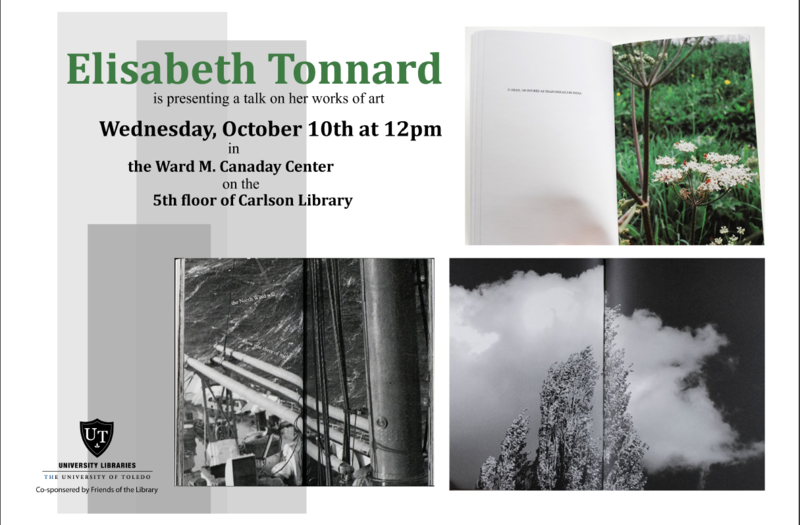 Elisabeth Tonnard, an artist and poet working in the areas of artists’ books, photography, and conceptual literature, will present a talk about her art on Wednesday, October 10, at noon in the Ward M. Canaday Center for Special Collections on the fifth floor of Carlson Library on UT’s main campus. Since 2003, Tonnard has published 25 books, which are included in numerous private and public collections. Her work features how visual culture and visual events are seen in the light of literature. Tonnard’s books have won numerous awards, including the jury prize of the Sheffield International Artists’ Book Prize last year. Her works have been exhibited widely, and she is a member of the Artists’ Book Cooperative. Tonnard received a master’s of arts in literature from Radbound University in the Netherlands, and a master’s of fine arts from the Visual Studies Workshop in Rochester, New York. She lives and works in the Netherlands. A reception will follow her talk. This talk is co-sponsored by the Friends of the University Libraries. For more information, contact David Remaklus, Carlson Library, at 419-530-4030.